World War I marks the first major conflict where the use of aircraft really took off. Unlike WWII, however, these early military planes were primarily used for reconnaissance. In January 1914, French Naval officer, engineer, and businessman Gustave Delange joined the Socit Anonyme des Etablissements Nieuport (A French airplane company) and started working on a new series of aircraft as chief designer. The first of the series was a sesquiplane racer-a biplane with a lower wing not more than half the surface area of the upper wing. This aircraft, the Nieuport 10, was originally designed to compete in the Gordon Bennett Trophy Race of 1914. However, the Nieuport 10 never saw the race. In fact, no plane did. The onset of World War I canceled the contest, and the Nieuport 10 was instead developed as a military two-seat reconnaissance plane. Nieuport's "V" strut series of planes (characterized by a smaller lower wing than upper wing) remained in production throughout the entirety of WWI. The concept of the design was to take the strength of the biplane's wire-braced wing cell and combine that with the better visibility of the parasol monoplane (a biplane without the lower wings). Other improved designs constructed out of this idea, but the Nieuport 10 remains the progenitor of all other "V strut" aircraft. Testing proved that while barely a match for Fokker aircraft, the Nieuport could hold its own and be an effective fighter with some modification. Properly armed, single-seat versions were created with a covered front cockpit and either an added Lewis Gun or Vickers machine gun. The guns could either fire through the center section of the top wing or mounted over it, firing forwards. In this form, the reconnaissance plane became a fighter. It was powered by a "Gnome" Lambda 80 hp engine. The French, Americans, and Russians all used variants of this aircraft design. Eventually, two major types of aircraft were developed from the Nieuport 10-the Nieuport 11 Bb and the Nieuport 12. The 11 was smaller and designated from the outset as a single-seater, while the 12 was a more powerful two-seater with a larger top wing. Production was also undertaken for a dedicated trainer version (Nieuport 83 E.2 designation). Once the Nieuport 11 appeared, the main duty of the 10 went to that of being a training machine. Two variants (Nieuport-Macchi 10.000's) survive and are displayed in Italy. 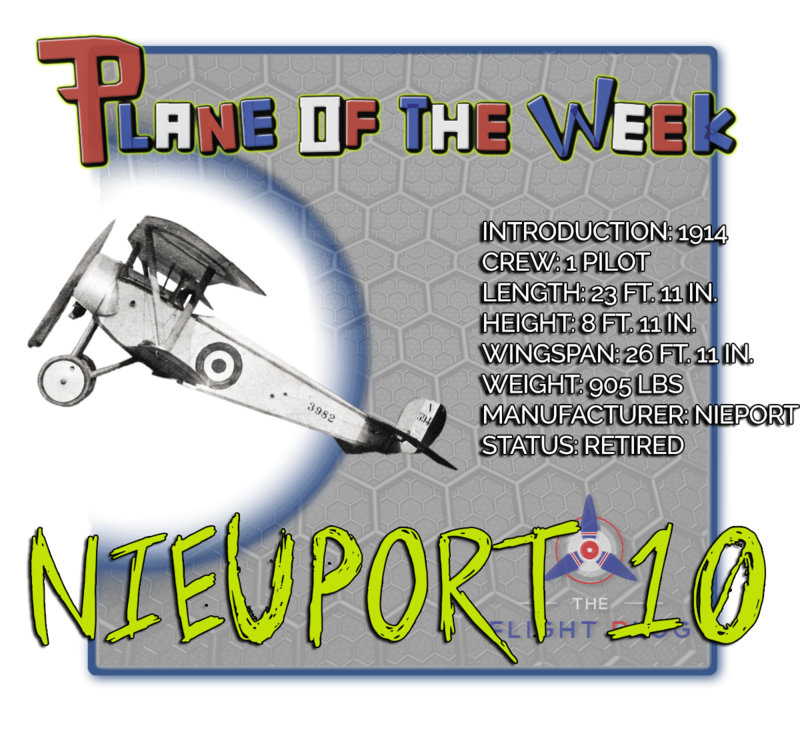 The Nieuport-Macchi 10.000 was an Italian-built Nieuport 10 with a number of detail modifications. An original Nieuport 83 E.2 is also on static display at The Old Rhinebeck Aerodrome in Red Hook, New York.